J. McGaffigan will be returning in the Men’s Grand Masters Single (3rd Place 2017). The Men’s and Women’s Masters Doubles each have two repeat entries from 2017, with the Wolf-Morelli (1st Plase 2017) and Kiester-Belakovskiy (5th Place 2017) doubles on the men’s side and the Lanfer-White (2nd Place 2017) and Belakovskiy-Vandersteel (3rd Place 2017) doubles on the women’s side. The Men’s Sweeps Team will field two entries each in the Club Four (1st and 15th Place 2017) and Club 8 (3rd Place 2017 (1st in Club)) events. In the Women’s Championship Double, the crew of Zieff and Sager will return after placing 3rd in the 2017 regatta. In the Men’s Lightweight Single, S. Haussmann will return (3rd Place 2017). In the Women’s Lightweight Single, L. Ayers will return (5th Place 2017). On September 9-16, five current members of the Riverside High Performance Group competed at the 2018 World Rowing Championships in Plovdiv, Bulgaria. Kevin Meador raced in the Open Men’s Single, placing 2nd in the D Final. 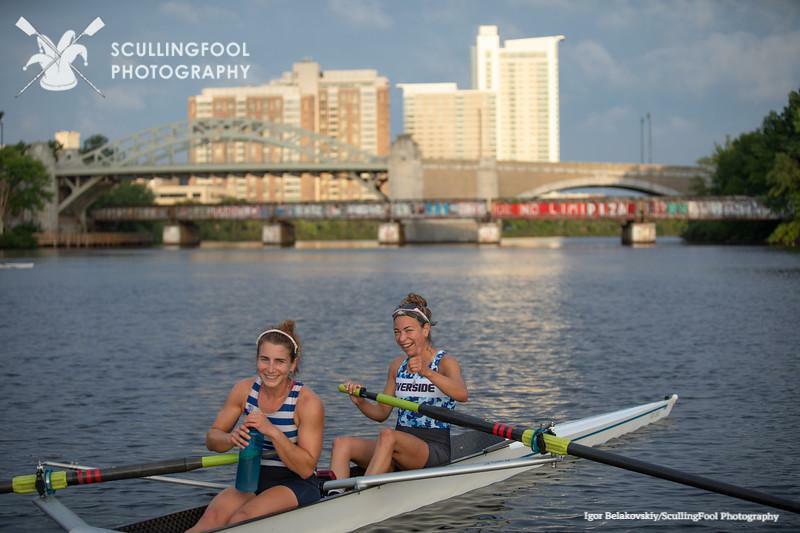 The US Lightweight Women’s Pair was comprised of Riverside athletes Jillian Zieff and Jen Sager, coached by Andrew Hashway and placed 2nd in the A Final. Hillary Saeger raced in the Lightweight Women’s Quadruple Sculls and placed 4th in the A Final. Sam Hausmann raced in the Lightweight Men’s Quadruple Sculls and placed 4th in the B Final. Five High Performance Group Alumni also competed. Emily Huelskamp, Elizabeth Sonshine, and Mo McAuliffe accounted for three of the members of the Open Women’s Quadruple Sculls crew and placed 6th in the A Final. Peter Schmidt raced in the Lightweight Men’s Double and came in 1st in the E Final. David Smith raced in the Lightweight Men’s Pair and came in 3rd in the A Final. RBC Sculler Catherine Widgery had a fantastic week out in California at US Masters Nationals. She medaled in all five of her events. Widgery took 3rd in the women’s open F double; 2nd in the mixed G-K quad; and won the open F quad and women’s open G single with a time of 4:49:194. 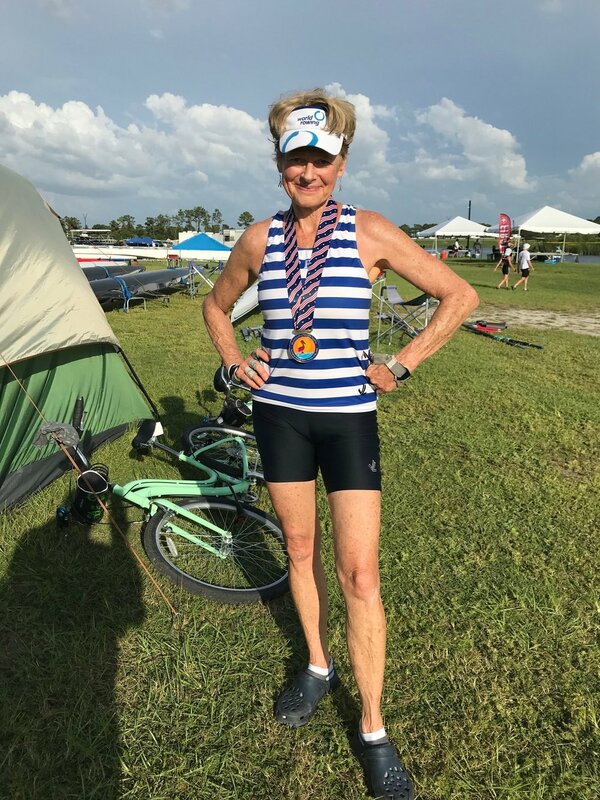 She is excited to continue her training for Masters Worlds in September, and hopes to become the fastest female rower in the world aged 65+. Five Riverside athletes will compete on two weeks at the World Rowing Championships in Plovdiv, Bulgaria. Jillian Zieff and Jen Sager will race a lightweight women’s pair; Kevin Meador will represent the United States for the men’s single; and Hillary Saeger and Sam Hausmann will race in the women’s and men’s lightweight quads. All five athletes qualified for their spot on the national team 2018 roster at the U.S. Senior and Para Trials II in early August. Jillian Zieff in stroke and Jen Sager in bow. Sager and Zieff have been best friend and training partners for six years, since they first started rowing together at Trinity College. That relationship continued through last year’s World Championship, where they raced for Team U.S.A in the lightweight women’s quad. They say this year’s win is a culmination of years of hard work. Keavin Meador took an unconventional route to racing the men’s single. 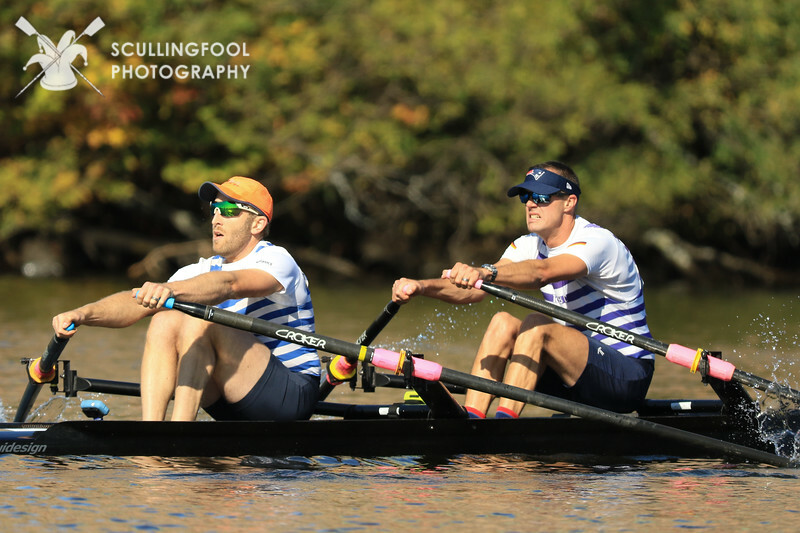 Before winning his event to qualify for World’s, Meador raced in the fall of 2017 with the men’s sweeps team and won the club 8+ event at the Head of the Charles. Meador only began full-time training for single’s events this past year. Following the National Selection Regatta and an injury that took him off the water for six weeks, Meador returned to the single two weeks out from Trials. Despite the fact that this was only his second sprint-race in a single, he won his time trial, his heat and came in second place in the semi-final. Meador then won his final to qualify for Worlds at 7:02.59, more than a full second ahead of Malta Boat Club in second, and five seconds ahead of Vesper in third. In the men’s and women’s lightweight quads, Sam Hausmann and Hillary Saegaer raced composite entries at Trials with fellow lightweight national team hopefuls. Saeger has been training in a quad here in Cambridge for what will be her seventh World Championship appearance; she has already medaled three times. Hausmann has been training for his event in Saratoga Springs, New York. Both quads were uncontested at Trials, but had to meet a time standard to qualify for Worlds. The lightweight women’s quad finished at 6:42.51, and the lightweight men’s quad came through the line at 6:11.61. Another successful year for Riverside at the 53rd Head Of The Charles Regatta! For the third consecutive year, Riverside took home the points trophy as well as racked up dozens of great results in all boat classes. Congratulations to all who completed, as well as Riverside members who raced with other teams this year! The Green Mountain Head was raced on a beautiful Vermont day, there were a lot of RBC rowers and many of them did well. Pictured below are some of the Riverside rowers with their prizes of apples, cider and maple syrup! 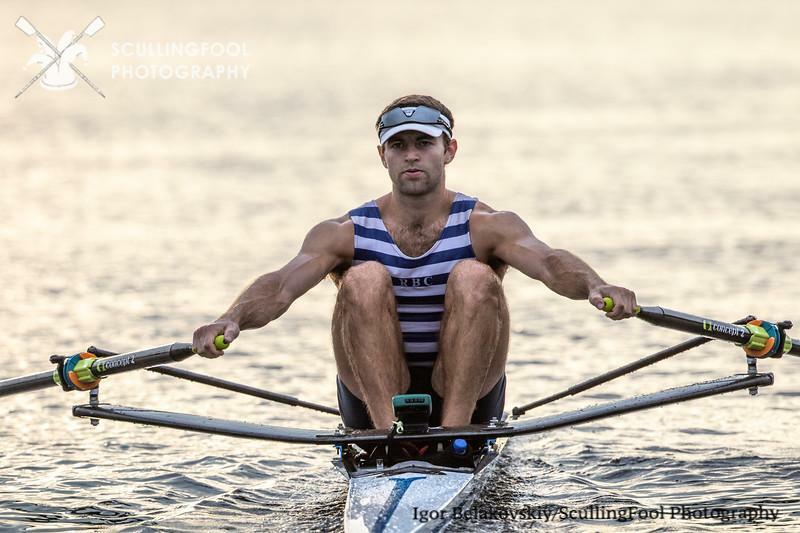 Alex Brown won 3rd place in the M1X 19-34 category with Joseph Hanna right behind him in fourth place. Peter Morelli won 2nd place in the M1X 35-44 category with Mike Farry coming in 4th place. John Tracey came in 4th in the 55-64 category with Mike Bannister coming in 5th. Ilana Zeiff came in 4th in the 19-34 category with Sarah Cottrill coming in 8th place. Elizabeth Diamond came in 4th in the 35-44 category. Lib and Pete, enjoying the regatta. Sean Wolf and Peter Morelli won the 80+ category (combined ages, they aren’t THAT old). Hilary Saeger and A. Cruz won the women’s open category. Riverside Stripes will be wearing Stars and Stripes at Worlds, and we would like to celebrate Judith Vogel, Tom Keister and Liane Malcos Keister for their dedication and expertise in launching these extraordinary athletes from Riverside’s humble boat club on the Charles. Many thanks, members and friends, whose sustained programmatic support is critical to this effort and accomplishment. We are immensely proud of our extended Riverside family and wish them good luck and good racing. Go Stripes! There are 19 current and former athletes and coaches who will be at Worlds. View of the race course in Oak Ridge, TN. 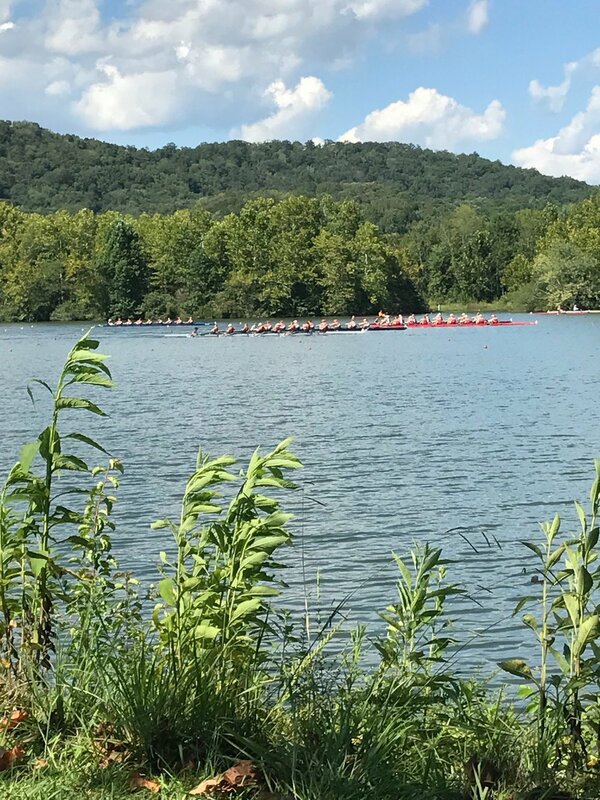 The US Masters Nationals was held August 17-20 on a beautiful cool river in Oak Ridge, TN. The water temperature was about the only thing that was cool as the heat steamed up during the day, but cool breezes and plenty of shade made the whole experience a delight as all the teams rented spaces for tents on shore to watch the racing. The weather and conditions were pretty much perfect though the sun was really intense as the rowers sat out in the boats waiting for the start of races. Three mornings there was an hour long fog delay but the organization by US Rowing was excellent as 99 teams with over 3000 rowers participated. Chinook again won the points trophy with almost twice as many points than second place, Texas Rowing Center. Only three members from RBC attended: Sean Wolf, Nikolay Kurmakov and Catherine Widgery. Catherine Widgery racks in the medals. 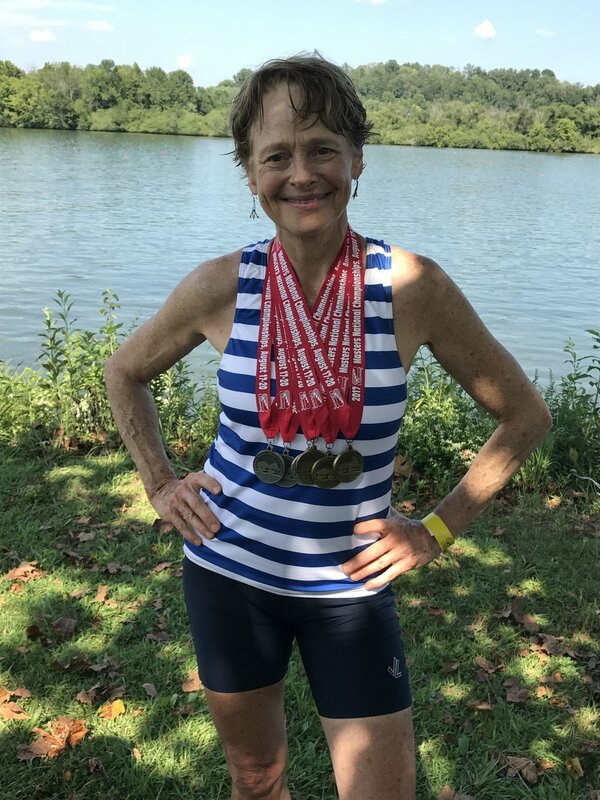 Catherine again competed as part of a composite team of masters women from around the country and earned three golds: WF2X, WG4+ and WE8+ and three silvers: WF4X, WD8+, WF8+. Masters Nationals moves to Oakland, CA next year. After a second consecutive win in the Club 8 event at HOCR, and a 5th place overall finish when including the college 2v/3v’s also entered the event, Riverside’s men’s sweeps program decided to up the ante and undertake a campaign to compete at the prestigious Henley Royal Regatta. Rumblings of a trip started at the tail end of summer 2016, where the sweeps team put together a strong senior 8+ of year-round guys, who had helped step up the training and competition level that the sweeps team did not usually have in recent years. This was the right time—the guys, attitude, and enthusiasm was there to start something that would hopefully spotlight RBC on the international club stage. The group met with Jeff in November and decided to take an 8 and a 4, a group of 12 rowers and two coxswains that would be named in early April, with lineups set by May. While winter training for the men’s team has predominantly been self-directed off-season training in the past, Henley training was much more rigorous. Thanks to the trainer-in- chief Jon Dwyer, the group created a training plan that would give the team focus and direction over the long 8- month process. Although everyone in the group had a full-time careers or were full-time grad students, the team trained eight or more times a week, and did pieces as a group, all while balancing work, life, and the occasional Phoenix nightclub cross-training sessions. The squad had multiple “check-ins” throughout the winter which included a watts/kilogram 30’ test, three 6k’s, a trip to C.R.A.S.H.-B’s, and a final 2k to round out the winter. About half the team set life time PR’s on the machine, while others came close to, or tied their college scores. Both the Thames Cup and the Britannia Cup are events designed solely for Club Crews, or only for members that have been formally members of the club for at least 3 months prior to the submission of entries. This is meant for guys like on men’s sweeps, who are rowing competitively post college, without necessarily having national team aspirations, and to prevent clubs from pulling in either summer guys or ringers to bolster their entry. Since most of the competition we face during the summer in club racing is against college kids who have come off competitive training environments with full-time coaching and resources, we wanted to have an apples-to- apples test of ourselves against true competitive club crews, which were mostly found abroad. Once lineups were finalized, the crew looked for some races to test ourselves against. While the UK club system is very developed, with several spring regattas and opportunities to formally race against college teams (such as the Marlow Regatta), the Stripes knew we needed to have some tune-up racing to experience the pressures of a race situation. Unfortunately, there is minimal club racing prior to the start of the summer, and any summer competition would be far too late for us before we headed across the pond. Thus, the team got creative began seeking out other U.S. crews going to Henley to scrimmage with. Fortunately, crews from WPI, Williams, and Harvard were willing to entertain these old men in some friendly competition over the course of the final month, which proved incredibly valuable for all parties involved. Satisfied with the training, and with the boat feeling good, the team flew out on June 20th to fit in the better part of the week training on the course. While the 8 was pre-qualified into the 32-crew tournament for the Thames Challenge Cup, the four was required to race on Friday of that week to earn a spot at the regatta into a smaller 16- boat event. On Friday morning, they laid down an excellent time trial, finishing in the top three which not only qualified them for the regatta, but also earned them the right to race as a “selected crew” alongside of the eight (selection is a type of seeding, in which selected crews, based on their qualifications and or race results, are set up so these potentially top crews avoid racing each other in the early rounds). 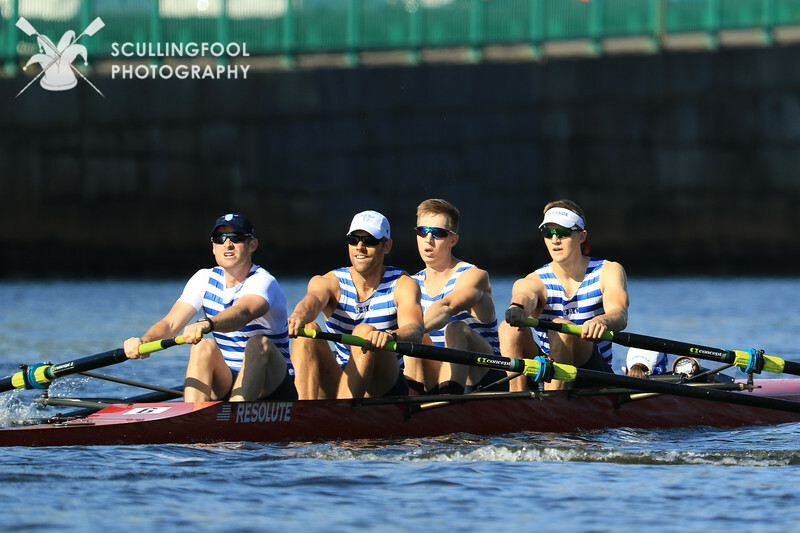 With qualification under their belt, the stripes made for Reading Regatta on Sunday where both boats got in morning and afternoon races against other crews competing at HRR. In the afternoon, the 8 won the Elite 8 by open water over WPI and Winchester College, and got some shiny hardware in the form of pewter mugs, a staple prize for many UK regattas. After several days of practice, waiting, with nerves and anticipation building, Wednesday finally arrived and race day was here. The Thames Challenge 8 raced at 4:05 pm against the Tideway Scullers, which was one of the more competitive boats in the event. We were confident that we could win, if we maintained focus and were able to listen to the coxswain’s calls and execute our race plan. No miracles needed. No miracles needed, but unfortunately quite the opposite happened. The boat got off a clean start, clipping along their high strokes at a 47. As the Tideway and Riverside came to the end of the island neck and neck, Sarah called the shift from a 47 down ten beats to the boat’s base pace of 37. At this point the cox box and microphone died and while stroke seat, and the coxswain attempted to remedy the problem, Tideway moved out a few seats. Once the entire crew realized the cox box was dead for good, they refocused on laying down the best base rate they could and reeling Tideway back in in silence. Without the guiding voice of the coxswain calling moves, rate, distance progressed, and margins, the crew tried to keep their cool, although the sense of unease and tension increased as the race progressed without us able to muster some collective traction to poke our bow-ball ahead. 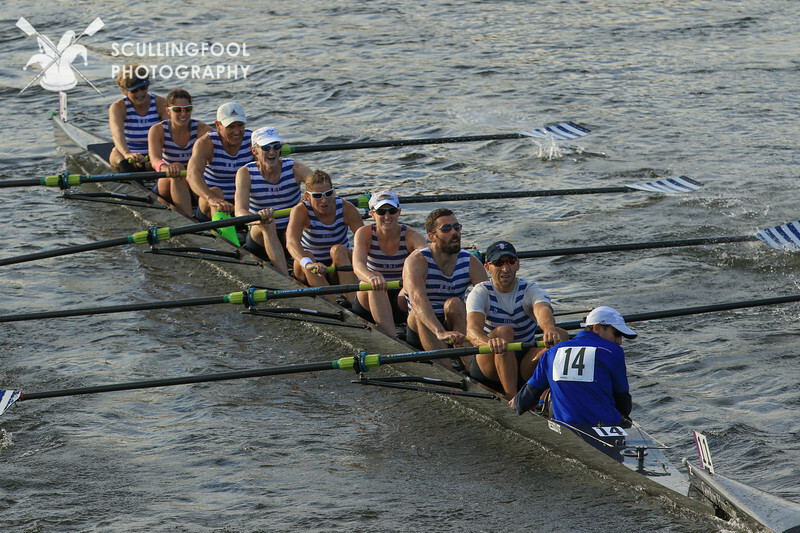 All eight rowers were able to gather briefly for their planned move at the Fawley marker, which closed the gap to only a couple of seats, but once the two boats moved into the enclosure area (where the crowds, music, and myriad distractions awaited), Tideway was able to execute a very good sprint sequence, which the Riverside boat could not match without a coxswain. Tideway finished ¾ of a length up, and Riverside’s 8 crossed the line feeling rather shell-shocked. Tideway rowed a very good race, and were faster on the day. They proved to be an extremely strong crew, who won on Thursday as well and were a canvas from progressing to the Semi-Final on Friday. There’s little room for error or protest in this sport and virtually none at Henley. While it was a tough pill to swallow, it reinforced for the 8 how important the process had been, and what a huge undertaking the entire trip had been. The bitterness everyone felt only revealed how much everyone one in the boat had invested in the project. And so, with a healthy sampling of local libations and a few stern warnings from the Catherine Wheel “not to return to this establishment” (we returned though…) the eight went to bed with high hopes for the Britannia 4’s race in the morning. And they did not disappoint. Riverside’s 4+ drew Stratford-Upon- Avon in the first round. Since Riverside had already raced a qualifying event, should they win, they would go right to quarter-finals, or top 8 crews. Known for delivering high drama since 1564, Stratford-Upon-Avon did not disappoint in the first round of the Britannia Challenge Cup. The race was a nail biter and even got a special mention from Sir Matthew Pinsent. The British crew moved up a full length on the stripes right off the start. After establishing a commanding lead, Riverside was able to stop their momentum, and then over the course of the next thousand meters, reel the Brits back in until they managed to put their bow ball just ahead. The second half of the race was a stroke for stroke slug fest all the way down to the enclosures at which point, just as they crossed the line, Stratford Upon Avon was able to put their boat ahead by “a canvas,” which is literally a couple of feet at best. While the team was gutted, no one—neither rower nor hungover supporting teammate—could have asked for a better, or a gutsier race. Racing done, the team got down to business. Hot tubbing, a trip to Oxford, fish and chips, a few pitchers of Pimm’s and a couple bottles of champagne all had to be attended to. Our sister boat club, Potomac Boat Club, was even there with us in spirit as they transferred us the funds for a few rounds of Pimm’s on them. Sunday afternoon saw all the stripes out in full force and dapperness, supporting the American teams and representing RBC with pride. By Monday morning however, the entire team was ready to come home. Months of training, two weeks in England, countless emotions, and unknown quantities of Pimm’s had the Meatwagon yearning for the comfort of Boston and cool breezes on RBC’s porch. While it was far from the Henley trip the men’s sweeps team had dreamed of, it was a hugely valuable experience and speaks volumes about how far the team has come, and how far it intends to go. While Riverside has only made a few trips to England to race in recent history, don’t be surprised if you see another men’s sweeps boat storming down the booms in the near future. And finally, the Meatwagon would like to thank the entire club for all the love and support as always. We couldn’t do it without your seemingly endless tolerance for our nonsense. Look out HOCR2k17.